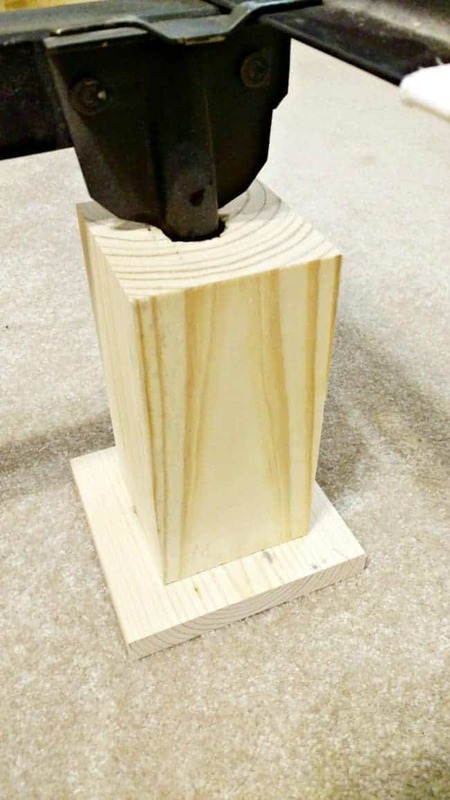 DIY bed risers are a simple solution for a short bed or when you need more under bed storage. You can make these super simple DIY bed risers for less than $15. Do you have a tall bed or a short bed? We have always had a taller bed so when we bought our sleep number we felt like we were sleeping on the floor. Not cool! It was like driving a truck and then getting in a car. You know that feeling if you have ever been there. 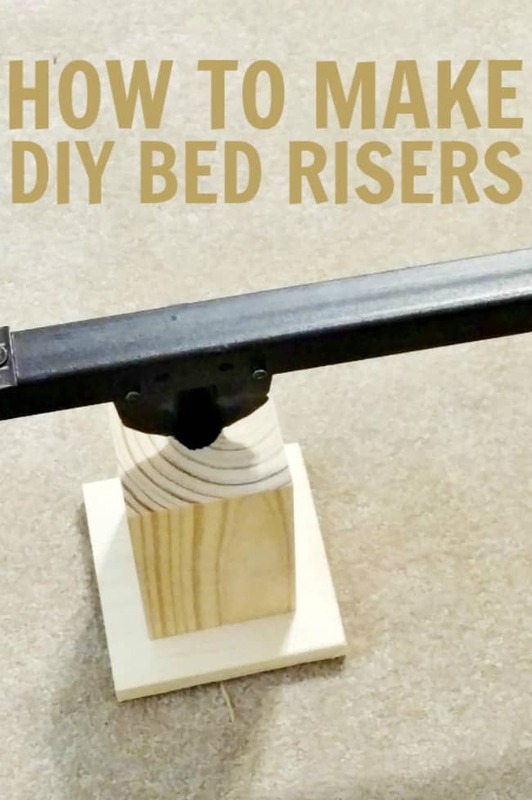 I’m not sure you can get any easier than these DIY bed risers. You will first need to purchase a piece of 4×4 lumber. How long you cut your riser pieces will truly depend on how tall you want your bed but we went with 7 inches. Chop down all your risers, don’t forget the middle support beams as well. 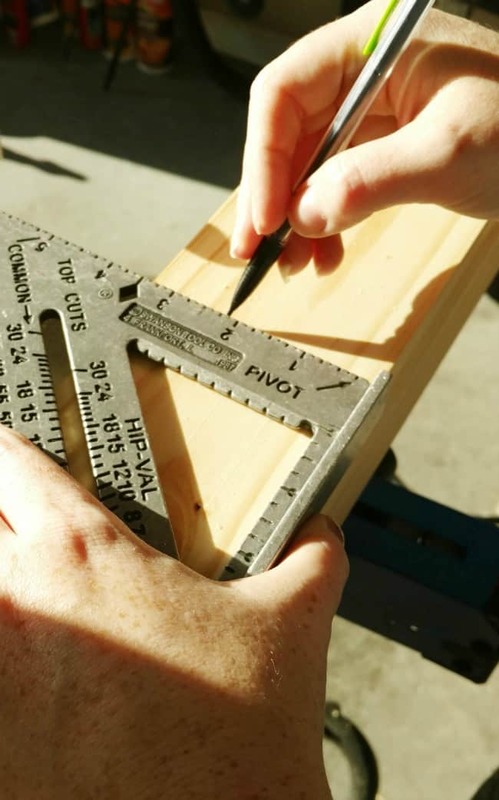 Once you have made all of your cuts you will need to use a 1-inch hole saw to make your middle hole cuts to place the metal bed frame (without the wheels attached) down into. Measure the length of your bed frame as they may all differ. 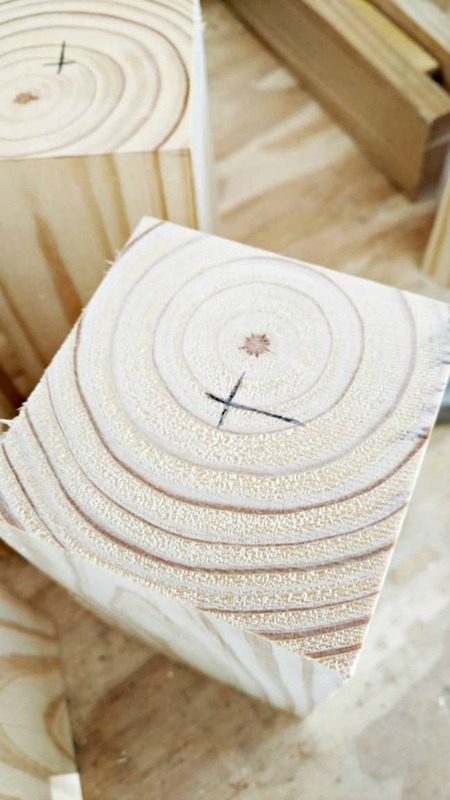 Measure the center of the 4×4 so you will know where to make the hole cut and drill all of your holes. This is how we first tried to use the risers but they didn’t feel as sturdy to us. So, we then took a 1x6x6 inch board and cut down 6-inch pieces to screw onto the base of the 4×4 pieces (using 2 2-inch nails in each base). This allowed them to be nice and sturdy with no wobble. Now that you have finished them (for right around $10 is what we spent on both pieces of lumber) you can then stain them a nice color or leave them unfinished. Even if you aren’t needing to raise your bed because you don’t mind it being short, these bed risers create awesome storage space under the bed. Which is always handy for off-season clothes, storing handbags (you ladies know what I mean) or whatever else you might need extra storage space for. DIY Multipanel Mirror – High End Look for Less! I would love a wide shot of what the finished product looks like, Can you update? Thanks! Emily, our bed skirt covers these up so a wide shot of the bed you can’t actually see them.